Eros Now's new web series -Modi- Journey of a Common Man. 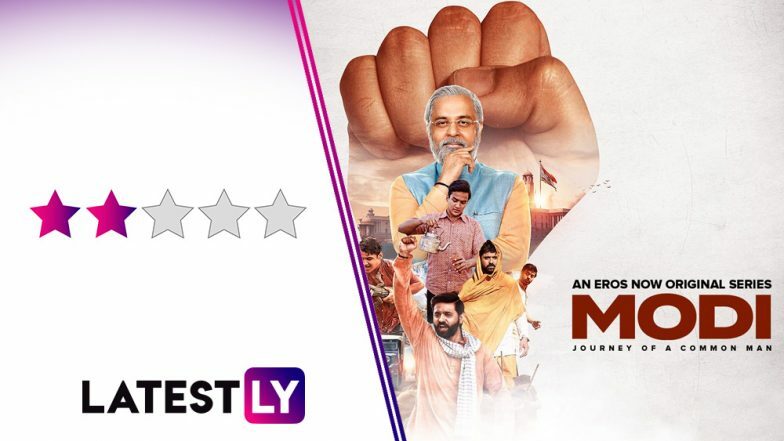 Amidst the controversy surrounding the Vivek Oberoi starrer PM Narendra Modi biopic's release, a new web series on Eros Now, Modi - Journey of a Common Man found itself releasing this week. Without much uproar surrounding the web series, it seemed like an intelligent decision on a marketing level for the streaming platform. Modi- Journey Of A Common Man is based on the book Modi: Common Man’s PM written by Kishor Makwana. The 10 part web-series had its first five episodes released on the streaming platform starring Ashish Sharma, Faisal Khan and Makrand Deshpande in lead roles. The Prime Minister's journey from his early days as tea-seller in Vadnagar, Gujarat to his association with the Rashtriya Swayamsevak Sangha at an early age is what ranges through the first five episodes. The 40 minute long episodes shuttle between Modi's childhood to his early twenties each played by actors Faisal Khan and Ashish Sharma respectively. I don't know if it is purely co-incidental but Ashish Sharma also happens to be the same actor who once featured on the small screen as Lord Rama in 'Siya Ke Ram'. Compare it to the trailer of the Vivek Oberoi starrer film and the series seems mellow in pushing the 'most capable candidate'image ahead of the elections. When it comes to painting the 'patriotic politician' image. At least, the tone of the web series is not as loud and much of the credit for it goes to the casting. While Faisal Khan's teenage Modi looks confident, it is Ashish Sharma's measured performance that makes the series stand apart from being 'just another forced content with an agenda'. Maybe the fact that director Umesh Shukla focussed less on getting the 'look' right and more on the mannerisms of his actors that worked more. The production design and background score are probably the most disappointing things for the series apart from its unidimensional content of course. The casting for key characters such as George Fernandes and Lal Krishna Advani should also have been much stronger but then how would Modi's character shine above all? This love letter of sorts to Modi's life intends to sell us a 25-year-old who is street smart and uses his scheming ways only when the better of the Nation is at stake. The five episodes end with the emergence of Modi who has been bitten by the political bug. Actor Mahesh Thakur will be taking over in the next five episodes of the series which will be the most crucial phase of the Prime Minister's life. We will be seeing the key decisions he took during his term as the Gujarat CM and the deadly Godhra riots too are expected to have a mention. Eventually, the last few episodes will culminate in his 2014 elections win to become the Prime Minister of India. With five more episodes to go, there's little hope for this series to address the burning questions relating to the Prime Minister's history or his future. My advice, in the current political scenario, it would be wise to consume content with a pinch of salt.